The Wuyi Mountains are a mountain range located in the prefecture of Nanping, in the northern border of Fujian province with Jiangxi province, China. The mountains cover an area of 60 km². 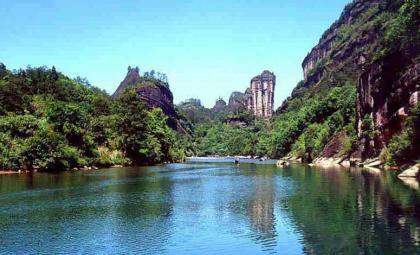 In 1999, Mount Wuyi entered UNESCO‘s list of World Heritage Sites, both natural and cultural. It is the most outstanding biodiversity conservation zone of Southeast China. The Wuyi Mountains are located between Wuyishan City, Nanping prefecture in Fujian province and Wuyishan Town, at Shangrao city in Jiangxi province. The area is connected to the road network by provincial road number S303. The world heritage site has an area of 999.75 square kilometres within an additional buffer zone of 278.88 km². Human settlement on the slopes of Mount Wuyi can be traced back 4,000 years by archeological remains. During the Western Han Dynasty, the ancient city of Chengcun was the capital of the Minyue kingdom. In the 7th century, the Wuyi Palace was built for emperors to conduct sacrificial activities, a site that tourists can still visit today. The mountains were an important center of Taoism and later Buddhism. Remains of 35 academies erected from the era of the Northern Song to the Qin Dynasty and more than 60 Taoist temples and monasteries have been located. However, most of these remains are very incomplete. Some of the exceptions for which authentic remains are preserved are the Taoyuan Temple, the Wannian Palace, the Sanqing Hall, the Tiancheng Temple, the Baiyun temple, and the Tianxin temple. The area is the cradle of Neo-Confucianism, a current that became very influential since the 11th century. The number of visitors to the area has increased from approximately 424,000 in 1993 to 700,000 in 1998. A raft trip down the Nine-bend River is the most popular activity followed by a visit to the “Thread of Sky” caves, where the narrowest walkway is only 30 cm. Visitor access to the biodiversity protection area is controlled. Read more at Wikipedia Wuyi Mountains .